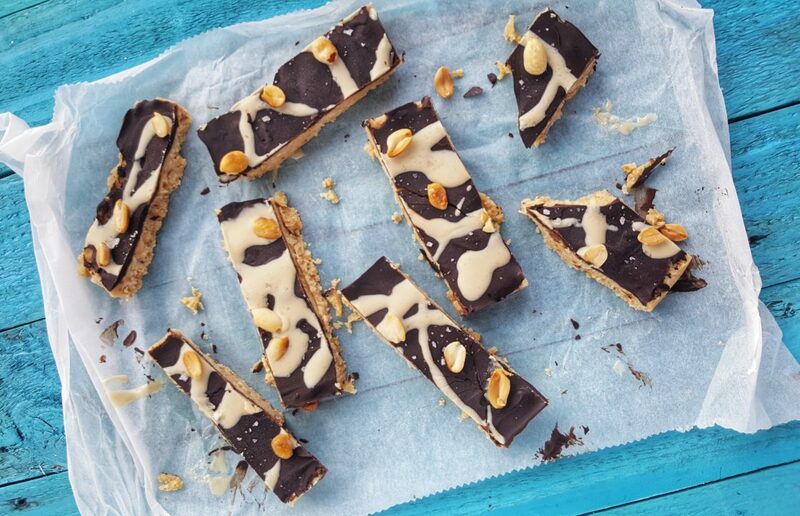 This recipe is inspired by the treats section of Avoca. They have this unbelievable Salted Peanut Tahini Slice that is just amazing. I tried on numerous attempts to recreate them and this has been my best effort. If you aren’t a peanut fan, almonds or cashews would be good substitutes. Blitz the peanuts in a food processor until a breadcrumb consistency is formed. Place the blitzed peanuts in a large mixing bowl with the salt and vanilla extract. Melt the tahini, coconut oil and honey together until fully combined and a runny mixture is formed. Stir the wet ingredients through the dry until well combined. Spread the peanut mixture evenly over the prepared baking tray and place in the freezer to set for at least 1 hour. Once the peanut mixture has set, melt the dark chocolate in a heatproof boil over a simmering pot of water. Remove the peanut mixture from the freezer and pour the chocolate over to cover. Scatter the reserved peanuts and drizzle the tahini over the chocolate. Return to the freezer and allow set. Cut into bars and store in the freezer. When serving, remove from the freezer and they will soften enough to bite within 1-2 minutes.